Bloomers have been out in force these past few weeks to ensure that the town will be a cornucopia of colours over the summer months. Tubs have been freshly painted and planted. 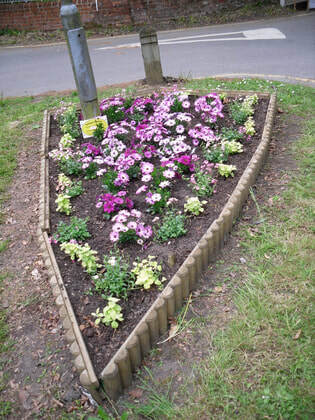 The Blickling Road flower bed opposite has had its annual makeover with beautiful colours of purple and yellow. We look forward to seeing their progress over the coming weeks. The hyacinths are looking good around the town and these have been kindly donated by the Blickling Estate. The daffodils are also looking good, some of which were donated last year by Derek and Mary Jeary. It may be raining, sleeting or snowing but our winter blooms are brightening up Aylsham Town.